Astronauts build the ASEM structure during the fourth EVA of the STS-49 mission in 1992. 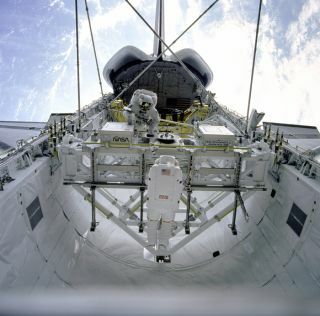 In this historical photo from the U.S. space agency, STS-49 Mission Specialist (MS) Kathryn C. Thornton (foreground) releases a strut from the Multipurpose Experiment Support Structure (MPESS) strut dispenser during Assembly of Station by Extravehicular Activity Methods (ASEM) procedures in Endeavour's payload bay. MS Thomas D. Akers, positioned on the opposite side of the MPESS, waits for Thornton to hand him the final strut. The two astronauts are building the ASEM structure during the mission's fourth EVA. The ASEM structure, locked in at four corners to payload retention latch assemblies (PRLAs), rises above the payload bay. In the background are the Intelsat cradle, the vertical tail, and the orbital maneuvering system (OMS) pods. The pale blue and white Earth is visible below.